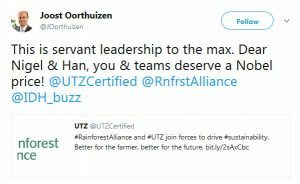 Our intended merger with the Rainforest Alliance is a major milestone in UTZ’s history. We see it as a chance to be more innovative together, and in partnership with our stakeholders. But what do our stakeholders think? 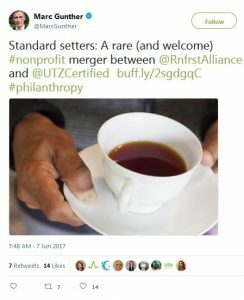 Reactions to the intended merger range from “deserving the Nobel Prize” to “good development, but why take the name Rainforest Alliance?” Here is a selection of responses from the market. We also received responses from respected certification program Fairtrade International and other NGOs. The Colombian Coffee Growers Federation represents more than half a million families dedicated to growing coffee in Colombia. They are just a small proportion of the millions of farmers worldwide we aim to support as members of the new Rainforest Alliance. Although we hear a lot of excitement about the merger, concerns are also raised. These include for example: “Why take the name Rainforest Alliance?” We are proud of our name. However, we believe Rainforest Alliance is a strong public facing brand that is already well recognized and respected. We want to play to this strength as well as UTZ’s strengths, which include our innovative way of bringing sustainable business practices to scale. “Do we need to change our packaging?’ is another concern we often hear. Don’t worry. At this point in time you do not need to change your packaging or anything else. You can use the UTZ logo for the foreseeable future. Until the new standard is published, which is expected to be early 2019, both programs will continue to provide you with the same services we currently offer. We aim to keep business speed throughout the merger process so that we create clarity as soon as possible. After the summer we will get back to you with more information about the timeline for the coming period. This will give you a better idea what to expect when. Please know that you will have plenty of time to make any required transition in the future. In the meantime…we appreciate your feedback, questions and concerns. Your input is important in helping us design the new organization. Please feel free to keep sharing with us via marketing@utz.org or leave your comment here. Read our other articles on the merger for more information.